Our chrome-iron liners are the most popular type of liners used by in the drilling fields. These cost-effective chrome-iron liners offer outstanding durability. The hybrid design of these liners combine the toughness of a high strength forged- steel outer hull with the hardness and corrosion resistance of a centrifugally cast, high-chrome-iron inner sleeve. The outer hull or shell, is manufactured from high strength carbon or alloy steel and heattreated to provide optimum mechanical properties. CNC machined to provide exacting tolerances to keep liner concentric of the inner bore in relationship with the outer guide diameters on the hull. This reduces the possibility of misalignment on installation and provides the end user with longer liner and piston life. The inner sleeve is made from a special, high-chrome-iron material that provides a consistent hardness in the range of 62-69 Rockwell. 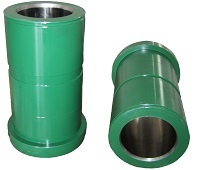 This means that the sleeve has excellent abrasion, erosion and corrosion resistance. The sleeve is through hardened during heat treat to provide high material hardness at all depths throughout the material. Our rigid qualitycontrol standards ensure that these features are consistent on each liner manufactured at our facilities. 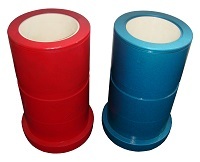 The sleeve is manufactured to the bore tolerances specified by API or better to provide longer life by reducing gaps between the liner bore and piston. Sunndaâ€™s Zirconia-ceramic liner is our premium and better performer product. It offers unique durability and promotes the longest piston life in extreme drilling conditions. Effectively resistant to heat, pressure, and corrosion, it is the ultimate in liner technology available today. Although initial costs are higher than traditional chrome-iron liners, the durability of the liner and the longer run times it promotes on pistons, equates into lower overall costs. Sunndaâ€™s Zirconia-ceramic liner is produced from a unique Zirconium-based ceramic compound that is extremely pure. This proprietary fine-grain structure Zirconium-based matrix is free of the impurities that affect lesser products. No other ceramic-liner material has better fraction toughness, which enables us to offer a ceramic liner that is hard and long lasting, tough, crack resistant, and not susceptible to thermal shock.